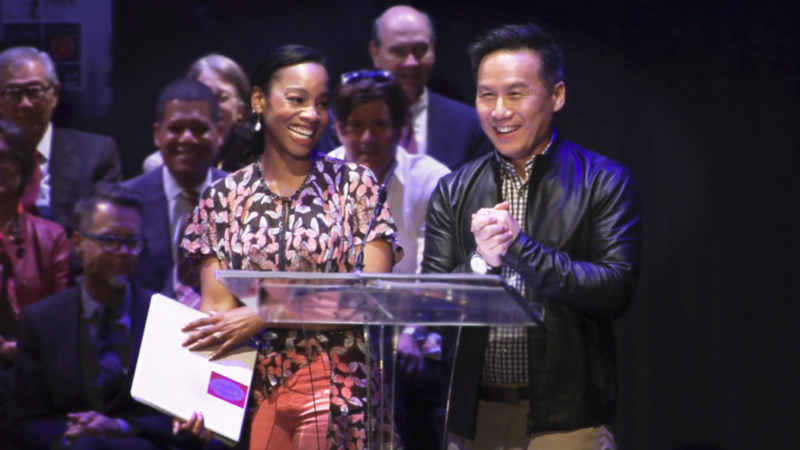 Tony Award winning actress Anika Noni Rose and actor B.D. Wong (Law and Order) at The Strand Theater ribbon cutting ceremony. I just returned from Ashland, Oregon, where I saw 5 plays in 3 days. Two Shakespeare plays, one premiere, and two revivals, all magnificently presented and engaging to the young audience. If you have never been to Ashland, then you should know that it is a wonder of commerce and art – a small city whose economy is profoundly based on theater. Restaurants, a multitude of small shops, and at least 4 book stores(!) all thrive because Ashland is a destination for the performing arts. In America, we are often reminded of the beneficial economic opportunities provided by high-tech, industry, and defense. Our politicians fall over themselves to give millions in tax breaks and low-interest loans to Silicon Valley entrepreneurs. How rare it is that the arts receive the same kind of largesse. In Berkeley, the Shotgun Players have transformed the corner of Ashby and M.L.K. from a nasty drug dealing blight into a thriving nighttime destination. And now, with the opening of the Strand Theater in San Francisco, we will, at last, see a positive change to Market Street. Theater can change the world and that’s not just a wish. Ashland proves it. The Ashby stage proves it. And now, The Strand has opened to prove the community building power of theater in San Francisco.